Night In The Woods is an adventure/platformer with a heavy focus on story, character and place. Explore Possum Springs as a cat named Mae who returns home after dropping out of college. Run, jump, participate in town activities, play bass, smash things, and hang out with your friends. Oh, and uncover horrible mysteries too. 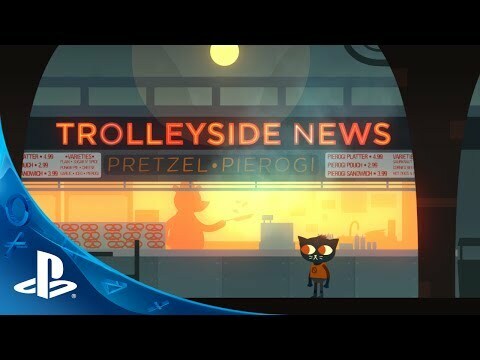 Night In The Woods takes place in Possum Springs, a deadend backwater town left behind by a crumbling mining industry, where there are few jobs and the future is bleak for those who stay. Mae the cat is a college dropout who returns home to reclaim her teenage life with her friends who haven't left: Bea, who stayed home from college to take over the imperiled family business. Gregg and Angus are highschool sweethearts, desperate to leave their hometown behind forever. And there's the weird kid, Germ. No one knows what his deal is. But what Mae finds is that life and her friends moved on while she was away. Strange things are happening to her and to the town. And there's something in the woods up behind the park that might mean an end to all of it. Night In The Woods is a story about letting go and holding on. Possum Springs and the surrounding area is filled with mystery, things to discover, and people to meet. You'll hang around town, run and jump on powerlines and rooftops, chat with your neighbors, and find new things to do all over the place. You'll enter first-person paws mode to have a closer look at points of interest. And at night, you'll explore a side of town Mae never knew existed.